Like most other tyre manufacturers Continental tyres are striving to improve their range to include much more economic and fuel saving tyres for the future. Indeed Continental have just completed tests together with ford using the Continental Van Eco Tyres and achieved a much greater fuel efficiency by using this tyre , a great result for Continental tyres. The new van tyre will have much less rolling resistance than previous van tyres , making this tyre about 4% more economical which means much less emissions. Continental tyres engineers have also designed the new tyre give car like handling by means of more comfort together with better handling on both wet and dry roads. 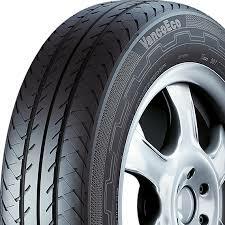 The first Continental Van Eco Tyres to be made will be in the tyre size 215/75R16 com load rating 113/111 t/l. This size fits most of the popular vans around at the moment including Ford Transits,Mercedes Sprinters and VW T5 range. Reduced fuel consumption and lower rolling resistance are the hallmarks of the new Continental Van Eco tyres for light commercial vehicles. Specially developed for vans such as the Mercedes Viano, Vito and Sprinter, Ford Transit and Volkswagen T5, Continental’s VancoEco boasts up to 30% less rolling resistance and a calculated four percent saving in fuel and emissions, than standard versions. At the same time engineers have managed to cut the braking distances on both wet and dry road surfaces making the tyre more car-like in its performance. Citroen C4 Picasso wheel problem -We all hear about these monster cars with problems- News - What Car?